Hi, there. Welcome. You may know me by my WarBirds handle, Webs (=webs=). If you don't, you probably have no idea what WarBirds is. For now, all you need to know is that WarBirds is a World War II air combat game you play over the Internet with and against hundreds of people around the world. It's pretty nifty, and calling it a game greatly underestimates its fidelity to history, its devoted following, and its incredibly addictive nature. I've been playing since August 1996. 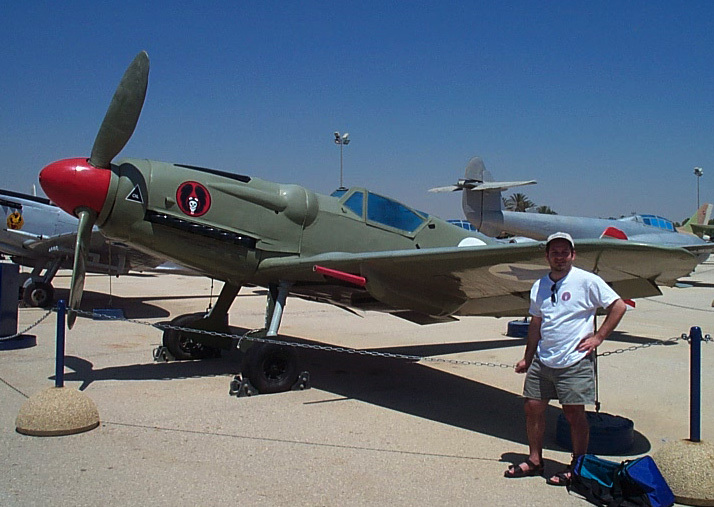 In June 1998, I was a veteran and lone-wolf WarBirds pilot. I had left my squad, the Swamp Foxes, because I wanted something a little more serious and historical. On vacation on the coast of Oregon, in a small used bookstore, I found a book I had to have, No Margin For Error: The Making of the Israeli Air Force by Ehud Yonay. Long before I'd heard of WarBirds - heck, long before I even owned a computer - I wrote a paper that outlined the chronology of Israel's air operations during its War of Independence as a freshman in John Guilmartin's Aviation Warfare and Technology course. I only had the topically limited libraries of east Texas to work in, however, and these many years later, I still wanted to learn more. So I bought the book. Although it covers the entire history of the Israeli Air Force, it lingers on the War of Independence. It occurred to me that in what was then WarBirds' main arena, with its crazy match-ups of Spitfire vs. Spitfire and FW 190 vs. Me 109, for example, seemed to lend itself to a simulation of that war, in which Spitfire fought Spitfire, for the most part. Furthermore, the WarBirds Mediterranean terrain hosted an airfield right where Israel is. At that moment, I decided to form a virtual version of the 101 Squadron. I invited any WarBirds pilots who didn't belong to a squad to join me. I didn't expect to sign up any ace veterans, so I specified training as a goal of the squad. I also accepted "foreign volunteers" - pilots with other squads who didn't want to leave them, but who wished to fly with us for training and scenarios on occasion. I formed the squad that August. A few months later, I found Robert Bracken's Spitfire: The Canadians, which to my astonishment included a beautiful picture of a 101 Squadron Spitfire (White 15) along with a narrative by Canadian Denny Wilson, who shot down two Egyptian fighters with that plane on Dec. 31, 1948. I used my journalism training to track Robert down and gave him a call to find out whether Denny Wilson was still alive and, if so, if he knew where to reach him. I thought I might get some good stories to share with my squadmates. Robert was eager to help. He had a number for Claire Wilson, Denny's current wife. I've since spoken several times with Claire, who has sent me photocopies of Denny's logbook, recommended books, and gave me contact info for several other 101 vets still with us. At the end of May 2001, I left for Israel for about two weeks. I was able to spend three days going through the IDF archives for 101 documents and pictures. Additionally, we organized a 101 Squadron trip south to the IAF Museum. This material is slowly trickling online. I've spoken to several now. I spent a weekend with Aaron Finkel, Mitchell Flint, and the late Rudy Augarten. I've spent time with Syd Cohen and Jack Cohen. Beni Peled sent me an e-mail. All the 101 guys I've reached have been eager to help me out and have given me permission to use their photos here. I was shocked no one had yet posted an online homage to these guys, and so I took it upon myself to do so. Of course, if you came in through the front door, you know that I've also written a book on the Avia S-199 after all this. Use the menu to the left. I hope you enjoy yourself. (I just want to insert a note on Web design here. I use a Mac and I've used many of the big Web design packages for various iterations of this Web site.